New Delhi, Oct 30 (IANS) The Janata Dal-United (JD-U) faction led by Nitish Kumar on Monday petitioned the Election Commission (EC) to expedite the decision in the party symbol row with the Sharad Yadav group. The JD-U delegation, in its fresh petition, based its arguments on the Supreme Court judgment in the Sadiq Ali versus Election Commission (1971) case. “As per the Supreme Court judgment in the Sadiq Ali case, there are two criteria for deciding the ownership of the party. 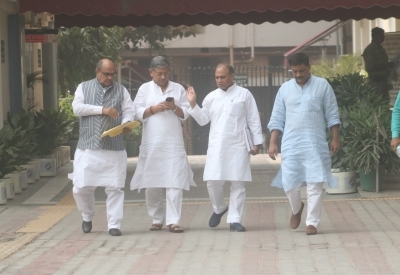 One is majority of the party’s legislative body and second is majority in the party’s apex decision making body, which in our case is the National Council,” JD-U General Secretary Sanjay Jha told IANS after the meeting. “Now, in the first criterion, there are 72 MLAs and 31 MLCs in Bihar besides 12 Rajya Sabha and Lok Sabha MPs. Of these, 100 are with us. In the National Council, there are 195 members of which 134 are with us. So on what basis is Sharad Yadav laying claim to the party symbol?” Jha said. He said the JD-U has told the EC that the Sharad Yadav faction is trying to delay the EC’s decision by submitting “irrelevant” documents to defer Yadav’s disqualification from the Rajya Sabha. “The three Election Commissioners heard our case for around 45 minutes. We have urged them to expedite the decision in the matter as the other party has no substance to support its claim,” Jha said. Sharad Yadav, a former President of JD-U, broke away with Bihar Chief Minister and JD-U President Nitish Kumar after the latter joined the BJP-led National Democratic Alliance in August this year.